Sometimes it has to be something really special. Our Bike Gourmet Dolomites tour is tailored for mountain bikers who love the luxurious. Living in a castle-like domicile, dining like a king and biking like in a dream. This trip will pamper your body and soul. Small groups let us achieve maximum riding fun. The Romantik Hotel Turm im Völs is one of the most exclusive accommodations in the Dolomites. Your ALPS guides guarantee you'll have the best mountain bike experiences. Arrival and a welcome menu. Enjoy an aperitif while your gaze glides over the majestic mountains of the Dolomites. Since the 13th century, the Hotel Turm in the middle of the village has occupied the most beautiful vantage point. Three towers features sensational terraces, exclusive suites and a beautiful pool area. However, the real jewel is in the kitchen. Stefan Pramstrahler, who is from Völs, has made a name for himself among those in the know. By bike, we'll ride into the neighboring valley Val Gardena. The circumnavigation of the Puflatsch brings us closer to the fabled white mountains. We'll pass the home of the Kastelruther Spatzen (famed musical group) and, in the evening, enjoy the exclusive hospitality of the hotel. Finest single tracks and enjoyable gravel paths are the specialty of the South Tyrol biking region. Our goal is the 2000 meter high Seiser Alm, which we will reach on select paths. The magnificent mountain world of the Dolomites will surround us all day. 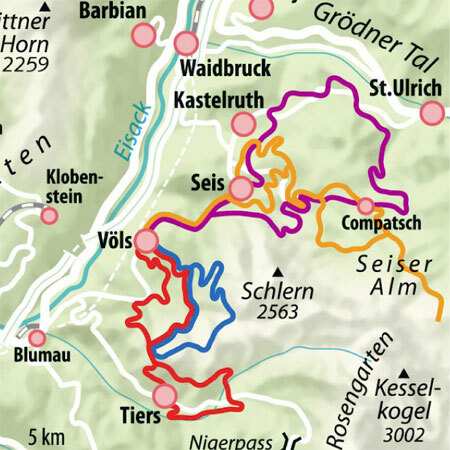 We'll enjoy the conclusion of one of the most beautiful trail descents in the Alps. A day in the mountains cannot be any more beautiful. From the hotel's indoor pool, you can swim directly outside, where you'll have a view of the mighty Schlern mountain. The pinnacle stage will lead us to the uncrowned star of the white Dolomite mountains. The Rosengarten with its legendary Vajolet towers is our goal. A landscape which looks like it was taken out of a picture book. In the evening, the chef Stefan will once again pull out all the stops. We'll enjoy a tasting menu with wines carefully selected for each course. The mountain village Völs is located on a sunny plateau, and today we'll explore its most beautiful single track. We may also visit Prösels Castle, which is the cultural center of the area with its exhibitions and concerts. We'll depart in the afternoon. Tom and Kerstin Bierl will be your tour guides on three exclusive dates only. We offer two different performance levels daily. Arrival: Arrival by car or by train to Völs/South Tyrol/Italy. Type of route: Forest and gravel paths, secondary roads, trails. Daily distance: Level 2-3 bis 1050 m elevation gain, Level 3-4 bis 1600 m elevation gain. Included in the price: Guided tours offered at two levels, 4 overnight stays / double room with half board in a 5-star Romantik Hotel with an exclusive wellness area and pool, three multi-course dinner menus, one tasting menu with wine, wine tasting.